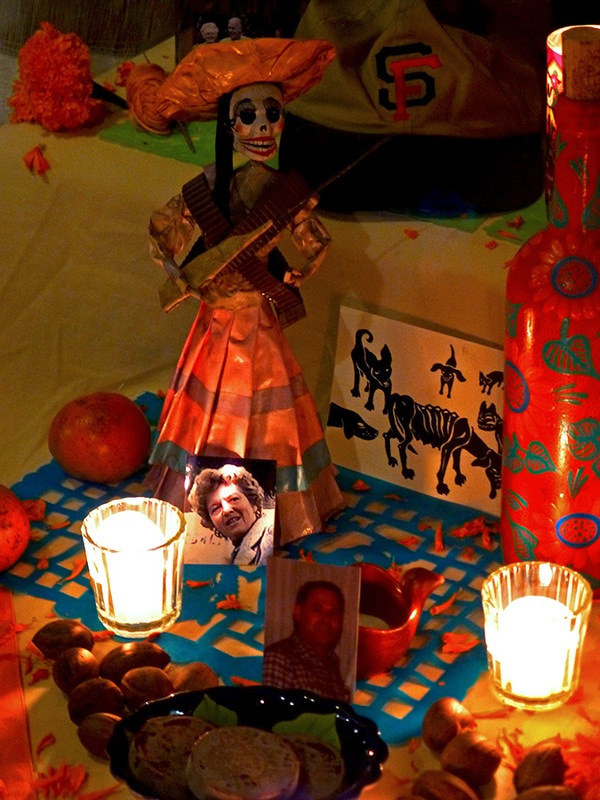 Poco a poco (little by little) my ofrenda has been constructed and composed. A yellow (the color of death in prehispanic southern Mexico) cloth covers two chests and papel picado, signifying the union between life and death, has been added. 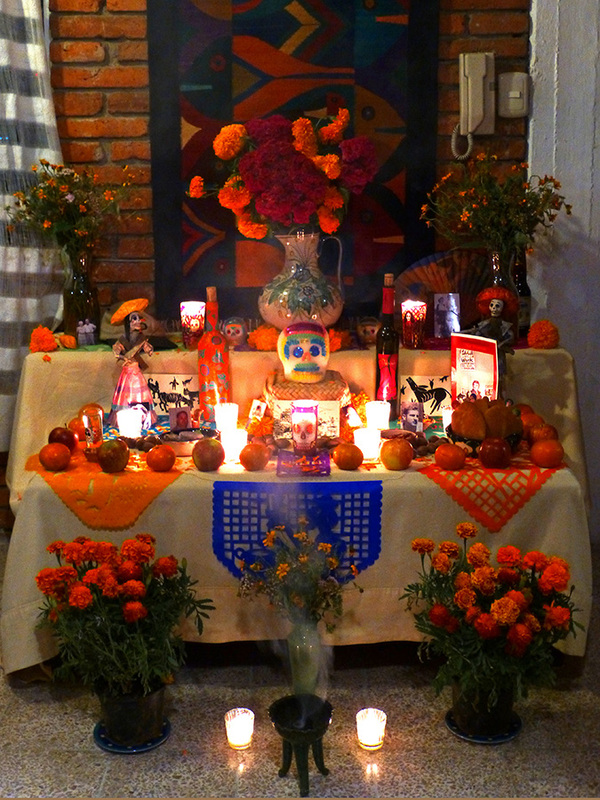 Photos of departed loved ones have been placed, along with apples, oranges, and nuts to nourish the difuntos, sal to make sure the souls stay pure, cempasúchitl and veruche (domesticated and wild marigolds) — their scent to guide the spirits, cockscomb to symbolize mourning, the previously mentioned flor de muerto from the mountains above Díaz Ordaz, and copal incense to draw the spirits home and ward off evil. 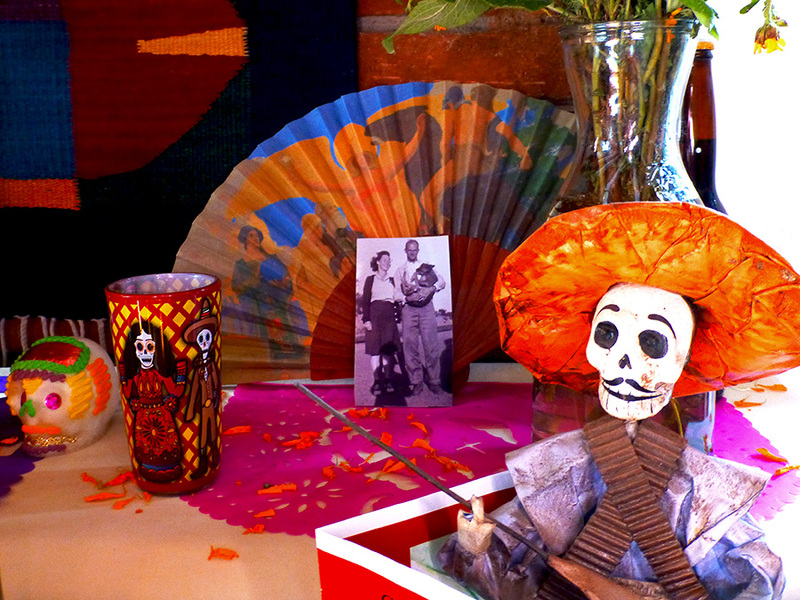 Sugar skulls, catrinas, and a few of the favorite things of my parents, grandparents, and in-laws have also been added. Lest the spirits become thirsty, there is water, mezcal, cervesa, and a bottle of port (for my mom) to drink. 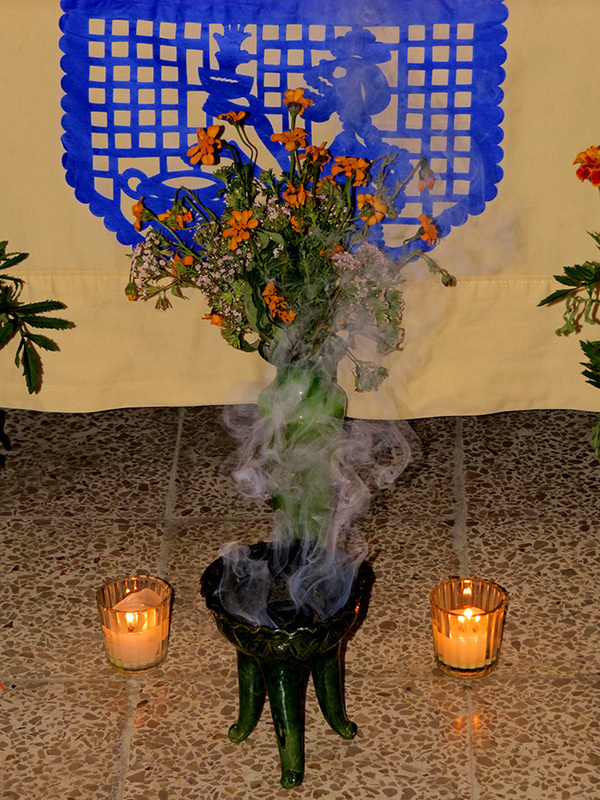 Last night, the candles and copal incense were lit to guide my loved ones to my Oaxaca home and, just to make sure, I sprinkled some cempasúchitl petals outside to help them find their way. It may not be the house where they lived, but I’m hoping they too believe, When you live in your heart, you are always home. How beautiful is your altar and your prose. Made me cry. Lovely Shannon – a very beautiful altar! Such a heartfelt, beautiful alter…… I’m sure your beloveds found their way ‘home’. Thank you for sharing the sincerity of meaning in each offering, just beautiful. I am sorry to not have met you while I was here in Oaxaca. We head home on Friday. Blessings! Muchisimas gracias for your kind words. I hope you enjoyed your visit!